We’re going to Norway and then to China the end of this summer. Join us for either trip or both! We have combined the two trips on this page so you can carefully read through each itinerary and see which one (or both) you would like to join. 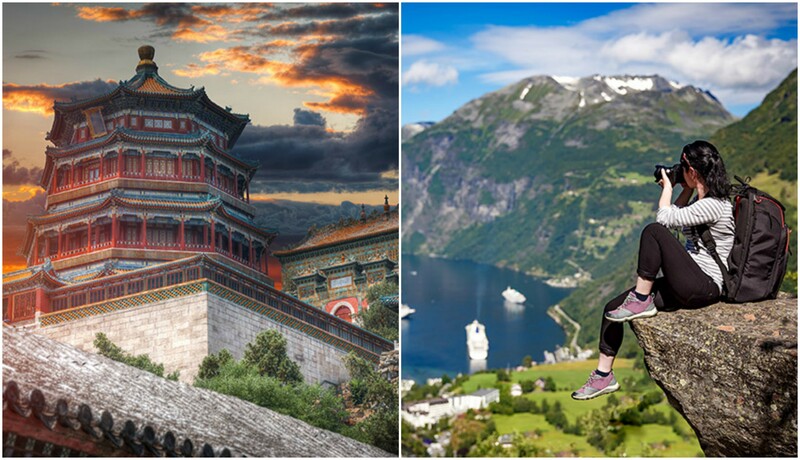 Whether you come with us to Norway and/or to China, you can talk to our agent, Sarah, at Morris Murdock Travel and she will help you book your tour. Her number is 801-483-6473. Let’s face it, Norway is blessed to be one of the most beautiful countries (if not the most beautiful) on this amazing planet. Did you know that Norway, which is a relatively small country, has more coastline than the United States?! It’s just a unique and stunning country. My first trip to Norway was 50 years ago when we went there to pick my brother Paul up off his mission. He was among the last missionaries to serve a 30-month mission. My family and I sailed from Newcastle, England (with our car in the belly of the ship) and we arrived on a misty-moisty morning in gorgeous Stavanger. From the moment I saw my brother and his companion emerge from the fog and greet us, Norway was injected into my veins. Though Maurine and I have returned once, we’ve longed to do an extensive visit to the most beautiful fjords in the world. Would you like to come with us? Please! Let yourself relax as you read over the detailed itinerary below. Feel the peace as you look at the photographs. Imagine yourself in these intensely picturesque places. We think it’s on your bucket list. It’s certainly on ours. This may be the only time we do this. And with our agents at Morris Murdock, we will plan a number of shore excursions that we can do together as a group of Latter-day Saints. Can you imagine having more fun than that? Do you want to call our agent right now and book this cruise? Call Sarah at 801-483-6473 and ask her all the questions you want then book the cruise. Would you rather just book the entire cruise online? You can CLICK HERE and then scroll down to where it says BOOK NOW. You click on that, set up your account then secure your place on the cruise! We can take about 80 people. Let’s do this together! For many, our pre-tour literary package will be a not-to-be-missed experience. We will focus on three places—the Harry Potter Studios in Leavesden, England; spending a day at Oxford with all the richness of this 800 year-old school and, of course, taking a day to be at Stratford upon Avon in the heart of Shakespeare Country. Our first visit to the Warner Brothers Studio in Leavesden was such a surprise. Yes, we are Harry Potter fans. Yes, we took our kids to the opening-day showings of each of the movies. Yes, we’ve read the books—but we had NO IDEA how much fun and wonder we would experience coming to the original movie sets. They told us to plan for about 3 hours—we stayed six-and-a-half hours and were the very last people to leave! The parking lot was empty as we made our way across to the single-remaining car. Oh, what a day of delight and an exploration into the depths of creativity! Oxford is endlessly interesting. Though we’ve been here a dozen times, we never tire of it! Whether it be exploring C.S. Lewis territory or walking over the sacred ground of religious martyrs or visiting the Ashmolean or Pitt Rivers Museums, this place is fascinating through and through. Come a visit the stomping grounds of William Shakespeare and his family. We will visit the home where Shakespeare was born, visit Anne Hathaway’s Cottage, and give you a chance for some shopping in this beyond-charming town. Today you’ll depart from your home city and travel to London! Upon arrival our coach will meet us at the airport and our adventure immediately begins! We head right over to explore the wizarding world of Harry Potter as we tour the Warner’s Brother Studio. Here we’ll walk in the footsteps of Harry, Ron and Hermione on actual sets used in the movies as well as props, costumes and special effects details! This visit will surely bring out the kids in all of us. (see description above). We’ll continue to the historic town of Oxford where we’ll stay for the next 3 nights. Today after our traditional English breakfast we’ll head off to explore Oxford. On our ½ day walking tour we’ll get to meander through the cobbled streets and quaint alleyways to the heart of Oxford University and pass sights such as University Church, Radcliffe Camera, Old Schools Quadrangle (The Bodleian Library) and The Bridge of Sighs. During the tour your guide will explain the history of Oxford from its humble beginnings to the world class University that we know today. Unlike most other tours that simply view from the outside, we’ll then visit inside Christ Church College. Christ Church has a deep and interesting history and is probably the city’s most famous college, not least because of its connections with the Harry Potter films and its iconic dining hall. The afternoon will be yours at leisure to shop and browse through the wonderful shops and sites of this most charming city. Today we explore the Tudor market town of Stratford-upon-Avon, which is the birthplace of poet and playwright William Shakespeare. We’ll visit the place of his birth, a restored 16th-century timbered house as well as the cottage once owned by Shakespeare’s wife, Anne Hathaway. We’ll continue on to the Church of the Holy Trinity, where Shakespeare was laid to rest. Tonight we’ll have a wonderful dinner at a local restaurant in town as we enjoy stories of history and literature. Today after breakfast we’ll take the scenic drive back to Southampton to board our cruise and meet up with the other tour members to explore magnificent Norway together. This pre-tour is a bargain package for only $769 per person (based on double occupancy). Call our agent Wendy at 801-483-5285 for further details or to book. Behold the staggering beauty of Norway’s fjords on an unforgettable cruise from Southampton. Feel like you’re floating through a fairy tale as you make your way from charming Hellesylt (an old Viking port) through the Geiranger Fjord, with its pine forests, surrounding mountains, central waterfall and lush valley. Take the funicular to the top of Ft. Floein, one of Bergen’s seven mountains, for magnificent views of the city, harbor and picturesque countryside. And when arriving in Southampton, leave time to explore the rich history and culture of London. Now let’s do the day by day and see how wonderful this will be. At 5:00 PM we sail for Norway on the newly refurbished Norwegian Jade! We are sailing towards this jewel of a nation: Norway! Today we will celebrate the Sabbath together with a wonderful devotional centering on the Savior Jesus Christ. Later in the day we will give one or two of our prepared lectures, one of which will be “Eleven Things You Probably Didn’t Know about The Book of Mormon.” This always leads to a wonderful discussion—especially when we are sailing together on The North Sea! This is actually the Geiranger fjord, with the waterfall called Seven Sisters. Although the region of Haugalandet has a rich Viking heritage, Haugesund is a vibrant young city touting culture and arts festivals. The Folgefonna Glacier to the north and the Preikestolen Mountains to the south – creates an enchanting backdrop for seemingly endless possibilities for outdoor exploration. Discover the Langfoss Waterfall – nominated by CNN as “One of the 10 Most Beautiful Waterfalls in the World” – that rushes down a steep mountainside and into the fjord below. Enjoy a scenic hike or bike ride on one of the many trails crisscrossing the landscape or visit the tranquil beaches of Karmøy for breathtaking views. Here a nature photographer tourist with camera shoots the Geiranger fjord. Looking for natural wonders that are truly wondrous? Look no further than the Geiranger Fjord. Emerge from a fairy tale pine forest and gaze at the fjord and surrounding mountains. You’ll find much more to amaze here, from a central waterfall to the winding roads and streams of the Moldskreddalen Valley. In Geiranger you’ll find a quaint village nestled in a valley in western Norway. Geiranger grants a respite to remember. Visitors come from all over to explore the fjord and its gorgeous views of nearby waterfalls, mountainscapes and charming farms. The scenery near Flam in beautiful Norway is nearly impossible to comprehend. Situated deep within the valleys of Norway, Flam is a nature lovers’ escape. The towering mountain cliffs and sweeping waterfalls are a pure splendor. The Flam Railway is a point of interest and so are the various fjord sightseeing tours. One of Norway’s most beautiful towns, renowned for its Jugend-style architecture and art nouveau style. Cruise visitors will immediately notice Alesund’s unique layout, as it is built on islands extending to the sea, and offers scenic views of fjords and the Sunnmore Alps. Alesund is the fishing capital of Norway! Bergen, Norway. View of historical buildings in Bryggen- Hanseatic wharf in Bergen, Norway. UNESCO World Heritage Site. View this lovely and charming Norwegian city from your cruise ship and you’ll see how the city is nestled between seven mountains, seven fjords and the North Sea. The Norwegian King resided here, and many historical events took place in this busy port. These events come alive when you amble down the old streets of Bryggen, past picturesque, wooden buildings and the Romanesque-style St. Mary’s church. Quaint docks at Kirkwall, Orkney, Scotland. This starkly beautiful island holds many ancient treasures like the mysterious Standing Stones of Stenness and the 5,000-year-old village of Skara Brae, which was discovered with the furniture and indoor drains preserved. Make sure to visit the striking trio of St. Magnus Cathedral, the nearby ruins of the Earl’s Palace and Bishop’s Palace. After touring, stop in a local pub to chow down on salmon and lamb dishes with the locals. And ask them about the wide range of Kirkwall’s specialty items, which includes cashmere and crafts. Today we sail south across the North Sea and head back to England so full of Norwegian wonder and joyful experiences. We will gather as a group for some special lectures from the Proctors, and, again, we will celebrate the Sabbath with a Christ-centered devotional and enjoy our last day together on this magnificent ship—the Norwegian Jade. We arrive early in the morning and will disembark for our journey to London. Better prices may be available at time of booking in all categories – We will always confirm the BEST PRICE. Every cruise has numerous ship-sponsored shore excursion options. We have designed our own package so that our Latter-day Saint group can enjoy each other’s company on our own busses and shore adventures with top-quality local guides. Part of the Proctor’s signature is doing everything we can to bring our group together and create a family-like feeling among our participants. This 4-port private shore excursion package includes hand-selected tours in Haugesung, Hellesylt & Geiranger Fjord, beautiful Flam and also stunning Bergen. The cost of this amazing package is only $549! Comparable NCL shore excursions for a similar package would be between $616 and $700+). Call our amazing and very helpful agent Sarah today with any questions or to send in your deposit for Norway (cabins will fill quickly): 801-483-6473. Can you imagine having more fun than this Norwegian Cruise? Do you want to call our agent right now and book this cruise? Call Sarah at 801-483-6473 and ask her all the questions you want then book the cruise. Would you rather just book the entire cruise online? You can CLICK HERE and then scroll down to where it says BOOK NOW. You click on that, set up your account then secure your place on the cruise! And finally, here’s the Post-Cruise Package—London! Many will want to do the post-cruise add on package in London. You’ve come a long way and we wouldn’t want you to miss this opportunity to be up front and personal with London—one of the greatest cities in the world. We always love to spend a day or two extra in London when we come to the British Isles. Changing of the Grenadier Guards outside of Buckingham Palace in London, England. Today we’ll be picked up at the Southampton cruise port and transfers into the English capital city of London! We’ll enjoy an extensive ½ day panorama city tour seeing many of the famous and royal highlights of this impressive city. Afterwards we’ll be taken to our hotel in the city center to enjoy the rest of the day and night at your leisure. London tower Bridge in sunset light. London is one of the most beautiful historical and modern city in the world. Today is at your leisure. Included in our package is a prepaid Oyster card that will allow you to travel on the iconic double decker buses, trains or tubes throughout London as you explore the city. Today after breakfast you will be transferred back to the airport for your return trip home to the US. Note: The post-cruise package will include visits to St. Paul’s Cathedral designed and master-minded by Sir Christopher Wren; the Tower of London where you will have a chance to meet the Beefeater Guards and see the Crown Jewels. A tour of London would not be complete without seeing Westminster Abbey, Parliament, Big Ben and Buckingham Palace. This taste of London POST CRUISE package with hotel/breakfast, attractions, oyster card and transfers all included is only $499. This is a bargain considering London is one of the most expensive cities in the world. Call our wonderful agent, Wendy, to get all the details and pricing for the post-cruise package: 801-483-5285. Let’s do this amazing trip together!